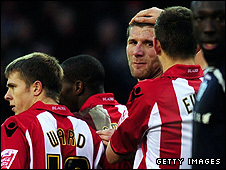 Richard Cresswell's header in first-half injury time earned a FA Cup third round replay for Sheffield United. United went close early on with Stephen Quinn's strike from Henri Camara's cross hitting the bar from eight yards. But it was QPR who took the lead when Jay Simpson side-footed Wayne Routledge's low cross past Mark Bunn. Cresswell's header from Quinn's cross drew United level and they could have snatched it when Ched Evans hit the crossbar with a powerful free-kick. The hosts started the game well with Chris Morgan's close-range header from Jamie Ward's free-kick flying just wide of the upright. Minutes later Quinn should have scored but instead hit the bar from close range after Camara pulled the ball back from the byline. It took QPR a while to get into the game and their first real chance came from Alejandro Faurlin whose dipping effort from the edge of area was well saved by Bunn. And just minutes later the visitors were ahead after Routledge found himself one on one with defender Andy Taylor on the wing and after beating his man he whipped in a low cross that Simpson converted. It looked as if QPR would take that lead into the break but United levelled through Cresswell's looping header from Quinn's cross. The second half was quiet in comparison with United's Jamie Ward's going close with an 18-yard strike while late on Evans thumped a 35-yard free-kick against the underside of the crossbar as the game ended level. "We're frustrated. But, if you're not clinical in the box, that's what happens. "We hit the bar a couple of times and overall I think we shaded the game, there's no doubt about that. "It was the last result we wanted. We tried to be as positive as we could and I wanted to finish the game here. "I didn't want to go down there and have any more games because the squad isn't big enough to handle it. Anyway, we'll go down there now and replay, and give it all we can." "We're in the hat after coming to a ground where many Premier League sides have floundered in the past. "But I'm slightly disappointed not to win it. "At half-time, the players were saying that the ball went out of play before the corner was awarded for their goal. But, after that, closing down the cross was not there and the header was disappointing. "It wasn't always pretty but I don't think FA Cup matches necessarily should be. They should be a fight and we showed plenty of fight today. "We set up to be difficult to beat and we achieved that to some extent. But we withstood Sheffield United's pressure early in the second half and kept strong." "We came here and had a go. We didn't win which is unlucky but we're still in the draw so we'll see what the replay brings. "I should have done better personally, but as a team we have to learn how to get clean sheets which we haven't done very well this season." 90:00+3:10 The final whistle is blown by the referee. 90:00+2:08 Henri Camara takes a shot. Save made by Radek Cerny. 90:00+1:10 Corner from the left by-line taken by Wayne Routledge, Header from close range by Kaspars Gorkss misses to the right of the goal. 90:00+0:25 Heidar Helguson fouled by Marcel Seip, the ref awards a free kick. The free kick is swung in right-footed by Wayne Routledge, Richard Cresswell makes a clearance. 89:50 Lee Williamson concedes a free kick for a foul on Alejandro Faurlin. Radek Cerny takes the direct free kick. 89:08 Free kick crossed by Glen Little, Damion Stewart makes a clearance. 89:08 Booking Alejandro Faurlin is shown a yellow card for unsporting behaviour. 88:55 Unfair challenge on Derek Geary by Alejandro Faurlin results in a free kick. 85:05 Mark Bunn takes the free kick. 85:05 Substitution Glen Little comes on in place of Jamie Ward. 85:05 Foul by Damion Stewart on Chris Morgan, free kick awarded. 84:14 Direct free kick taken by Gary Borrowdale. 84:14 Substitution Heidar Helguson joins the action as a substitute, replacing Patrick Agyemang. 84:14 Booking Derek Geary goes into the referee's book. 83:57 Hogan Ephraim fouled by Derek Geary, the ref awards a free kick. 83:09 Shot from just outside the box by Jamie Ward goes over the bar. 81:20 Marcel Seip challenges Patrick Agyemang unfairly and gives away a free kick. Peter Ramage takes the direct free kick. 80:46 Shot by Derek Geary from deep inside the six-yard box clear the bar. 77:32 Substitution (Sheff Utd) makes a substitution, with Lee Williamson coming on for Stephen Quinn. 74:12 Stephen Quinn challenges Mikele Leigertwood unfairly and gives away a free kick. Gary Borrowdale restarts play with the free kick. 70:31 Substitution Hogan Ephraim is brought on as a substitute for Akos Buzsaky. 70:14 Unfair challenge on Wayne Routledge by Ched Evans results in a free kick. Damion Stewart restarts play with the free kick. 69:13 Henri Camara takes a shot. Gary Borrowdale gets a block in. Corner from left by-line taken by Jamie Ward. 68:38 Corner taken short by Derek Geary. 66:22 The official flags Jay Simpson offside. Mark Bunn takes the direct free kick. 66:03 The ball is swung over by Jamie Ward, Nick Montgomery takes a shot. Save by Radek Cerny. 65:23 A cross is delivered by Ched Evans, clearance by Mikele Leigertwood. 63:01 The referee blows for offside. Radek Cerny takes the indirect free kick. 62:40 Centre by Ched Evans, Radek Cerny makes a save. 60:51 Alejandro Faurlin takes a shot. Marcel Seip gets a block in. Inswinging corner taken by Alejandro Faurlin, Damion Stewart produces a right-footed shot from deep inside the penalty area which goes wide of the left-hand post. 60:01 A cross is delivered by Wayne Routledge, Chris Morgan makes a clearance. 58:20 The ball is crossed by Jamie Ward, clearance made by Kaspars Gorkss. 56:37 Ched Evans fouled by Damion Stewart, the ref awards a free kick. Ched Evans takes the direct free kick. 55:13 The assistant referee signals for offside against Henri Camara. Radek Cerny takes the indirect free kick. 54:30 Centre by Richard Cresswell, Jamie Ward has an effort at goal from just inside the box that misses to the right of the target. Correction - 52:02 Gary Borrowdale challenges Jamie Ward unfairly and gives away a free kick. Jamie Ward produces a shot on goal direct from the free kick. 52:02 Free kick awarded for an unfair challenge on Jamie Ward by Gary Borrowdale. Jamie Ward has a direct shot on goal from the free kick. 51:47 Kaspars Gorkss gives away a free kick for an unfair challenge on Ched Evans. Nick Montgomery restarts play with the free kick. 50:41 Henri Camara crosses the ball, clearance made by Kaspars Gorkss. 50:11 Unfair challenge on Patrick Agyemang by Marcel Seip results in a free kick. Direct free kick taken by Damion Stewart. 49:35 Chris Morgan fouled by Jay Simpson, the ref awards a free kick. Direct free kick taken by Mark Bunn. 48:26 Free kick awarded for a foul by Alejandro Faurlin on Richard Cresswell. Andy Taylor takes the direct free kick. 47:44 Jamie Ward delivers the ball, Radek Cerny makes a save. 46:57 Henri Camara takes a shot. Save made by Mark Bunn. Stephen Quinn decides to take the corner short. 46:27 Jamie Ward crosses the ball, clearance by Damion Stewart. Alejandro Faurlin decides to take the corner short. 45:53 Unfair challenge on Nick Montgomery by Akos Buzsaky results in a free kick. Derek Geary restarts play with the free kick. 45:01 Substitution Matthew Kilgallon leaves the field to be replaced by Marcel Seip. 45:00+3:35 It is the end of the first-half. 45:00+2:54 Assist on the goal came from Stephen Quinn. 45:00+2:54 GOAL - Richard Cresswell:Sheff Utd 1 - 1 QPR Richard Cresswell finds the back of the net with a headed goal from close in. Sheff Utd 1-1 QPR. 45:00+1:33 Inswinging corner taken left-footed by Stephen Quinn, clearance by Kaspars Gorkss. 45:00+0:43 Damion Stewart concedes a free kick for a foul on Ched Evans. Free kick crossed right-footed by Jamie Ward from left wing, Damion Stewart manages to make a clearance. 39:54 Alejandro Faurlin gives away a free kick for an unfair challenge on Stephen Quinn. The free kick is delivered left-footed by Stephen Quinn from left wing, Radek Cerny makes a save. 38:34 Wayne Routledge provided the assist for the goal. 38:34 GOAL - Jay Simpson:Sheff Utd 0 - 1 QPR Goal scored by Jay Simpson from deep inside the penalty box low into the middle of the goal. Sheff Utd 0-1 QPR. 36:38 Free kick taken by Damion Stewart. 36:38 Booking Andy Taylor is cautioned by the ref for unsporting behaviour. 36:25 Andy Taylor challenges Wayne Routledge unfairly and gives away a free kick. 34:42 Damion Stewart takes the direct free kick. 34:42 Booking Richard Cresswell booked. 34:33 Damion Stewart fouled by Richard Cresswell, the ref awards a free kick. 32:08 Matthew Kilgallon decides to take the corner short. 31:56 Alejandro Faurlin takes a shot. Save by Mark Bunn. 30:43 Effort on goal by Mikele Leigertwood from just outside the area goes harmlessly over the target. 28:27 Kaspars Gorkss gives away a free kick for an unfair challenge on Henri Camara. Direct free kick taken by Matthew Kilgallon. 26:55 Jay Simpson takes a shot. Save made by Mark Bunn. 23:17 Unfair challenge on Patrick Agyemang by Matthew Kilgallon results in a free kick. Strike on goal comes in from Akos Buzsaky from the free kick. 21:13 Peter Ramage challenges Jamie Ward unfairly and gives away a free kick. Andy Taylor takes the free kick. 20:31 Unfair challenge on Wayne Routledge by Andy Taylor results in a free kick. Peter Ramage takes the free kick. 19:59 Jamie Ward takes the inswinging corner, Peter Ramage makes a clearance. 19:50 Centre by Stephen Quinn, Peter Ramage gets a block in. 17:50 Henri Camara produces a right-footed shot from close range which goes wide of the right-hand upright. 16:44 Free kick awarded for a foul by Mikele Leigertwood on Richard Cresswell. Free kick taken by Matthew Kilgallon. 13:06 Jamie Ward fouled by Damion Stewart, the ref awards a free kick. Free kick taken by Matthew Kilgallon. 11:06 Gary Borrowdale gives away a free kick for an unfair challenge on Jamie Ward. Jamie Ward takes the direct free kick. 10:38 The ball is crossed by Wayne Routledge, clearance by Chris Morgan. 8:52 Henri Camara delivers the ball, Stephen Quinn takes a shot. 8:02 The referee blows for offside. Radek Cerny takes the free kick. 6:53 The referee gives a free kick against Richard Cresswell for handball. Free kick taken by Peter Ramage. 5:46 Derek Geary fouled by Alejandro Faurlin, the ref awards a free kick. The ball is delivered by Jamie Ward, Chris Morgan produces a header from close range which goes wide of the left-hand upright. 4:09 The assistant referee signals for offside against Henri Camara. Radek Cerny takes the indirect free kick. 2:58 Henri Camara has an effort at goal from outside the box which misses left. 2:33 Centre by Richard Cresswell, Alejandro Faurlin manages to make a clearance. 0:45 Akos Buzsaky gives away a free kick for an unfair challenge on Jamie Ward. Direct free kick taken by Derek Geary. 0:17 Derek Geary sends in a cross, save made by Radek Cerny.